We’re thrilled that you’re interested in learning more about our affiliate program! Below is a summary of our program and why it would be good for you and your community. We believe in real food without added chemicals. Products without toxins. Labels without lies. We believe in complete ingredient transparency. We take this mission seriously. That’s why we source the highest quality ingredients we can find and deliver the cleanest products we can to our customers. 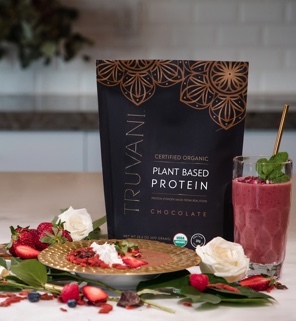 We offer our Plant-Based Protein Powder in two great flavors: Chocolate and Vanilla. Both Protein Powders are USDA Organic and Non-GMO. Both are vegan. Both are formulated with limited, real ingredients. And they taste great, too! Also available in single serve travel packets. Perfect for on the go! 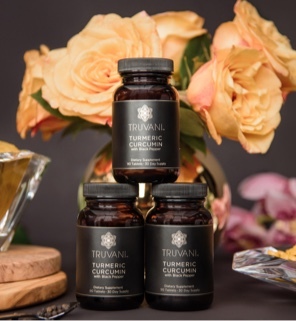 We offer a Turmeric Supplement like no other. It’s a tablet, not a capsule. This means that you can take it with a glass of water. You can also crush it up to add to a smoothie or make golden milk. It’s also formulated without any toxic fillers or binders. Instead, we use a blend of organic acacia fiber, organic rice hulls, and organic rice extract blend. You can promote vibrant skin, strong nails, and support the health of your hair, joints, and bones with Marine Collagen. 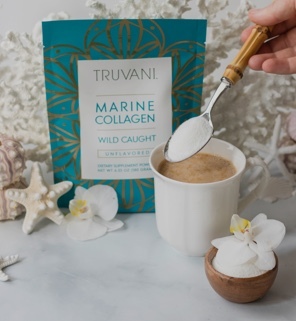 We make adding our Marine Collagen to your regimen EASY. You can stir it into your morning coffee, mix it with fresh-pressed juice, or blend it into your smoothie. The best part? There’s almost no flavor at all! So you’ll barely notice a change in taste or texture. Now you can get all the amazing benefits of bone broth without doing any of the work to make it. 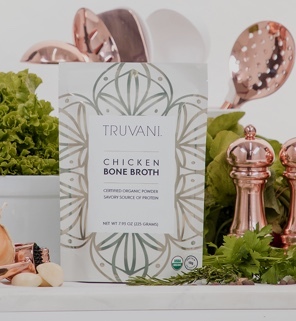 We offer a convenient bone broth powder that’s filled with good-for-you ingredients. You can use it to make a bone broth drink, you can use it in your favorite soup, and you can even use it in your everyday foods, just sprinkle in a little while you’re cooking! At Truvani, we believe in our mission and our products. And we’re looking for affiliate partners who do, too. You Use and Love Our ProductsWe’re looking for affiliate partners who believe in our brand and love our products. We want you to feel joy when you share our products with your people. This should be fun for you! If this sounds like you, then we’d love to hear from you. You Have An Audience Who Will Also Use And Love Our ProductsWe want to make sure your audience is a great fit for our products. If your audience is health conscious, if they like natural products, if they’re into fitness, they can be a great fit for our product. But we’re not only looking for affiliates in these markets. If you think your audience is a great fit, be sure to fill out an application! You Want to Make Some MoneyWe take our relationships with our affiliate partners seriously. We want you to succeed. We want you to enjoy this partnership as much as we do. And we also want you to make some money. That’s why we start each of our affiliates out with a 20% commission for not only the inital order but also ongoing subscriptions and future orders. Who can apply Anyone with a health, wellness, or beauty related website or following is welcome to apply for an affiliate account. You’re required to submit a W9 form (a W8BEN form for international influencers) if your influencer application is approved. Approval Process Influencer applications are reviewed within 5-7 business days. Typically we welcome 3-4 affiliates at a time so we can work closely with each one to maximize their success. Marketing We don’t allow influencers to advertise on networks as our brand or by using our common branding information. If this is done, we hold the right to immediately suspended your influencer account and any unpaid influencer commissions will be null and void. We require that you use Truvani approved banners, images, and logos in all Truvani promotions and email or social media mentions. These can be found in your affiliate account. If you need any additional marketing materials, please contact [email protected]. Commissions Commission are paid out monthly (typically the first week of each month) for commissions incurred over $50. Commissions are paid out via PayPal. If you have any questions, please don’t hesitate to contact our affiliate support team at [email protected]. They are ready and available to assist you in the process. We pride ourselves in being able to help you as much as you need.